I do not make these often enough. Clearly. It was Christmas the last time I made them, and they were so worth it, but I forgot about them until today. 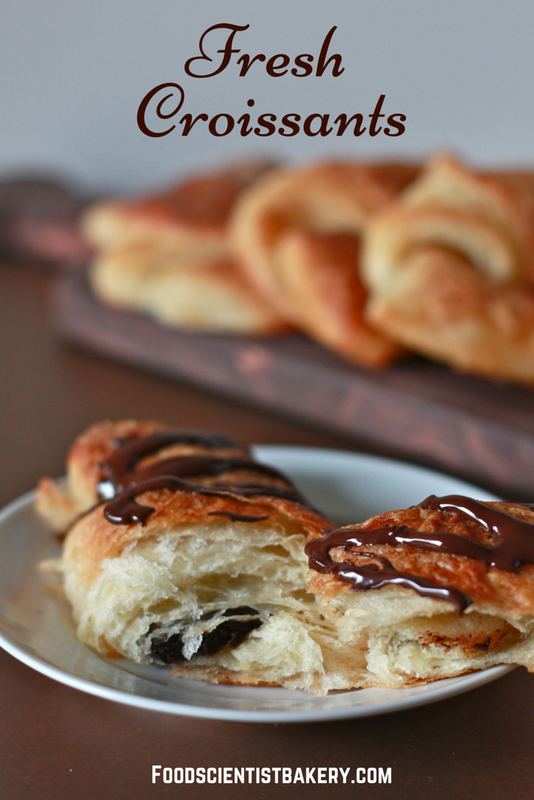 I passed by Dunkin’ Donuts and wanted a chocolate croissant really badly, so I decided to make a batch for the holiday weekend. Must be a holiday recipe for me! They’re buttery and delicious on their own or you can use them as the most amazing sandwich base ever. I also tried my hand at chocolate ones, since that’s what I was craving. 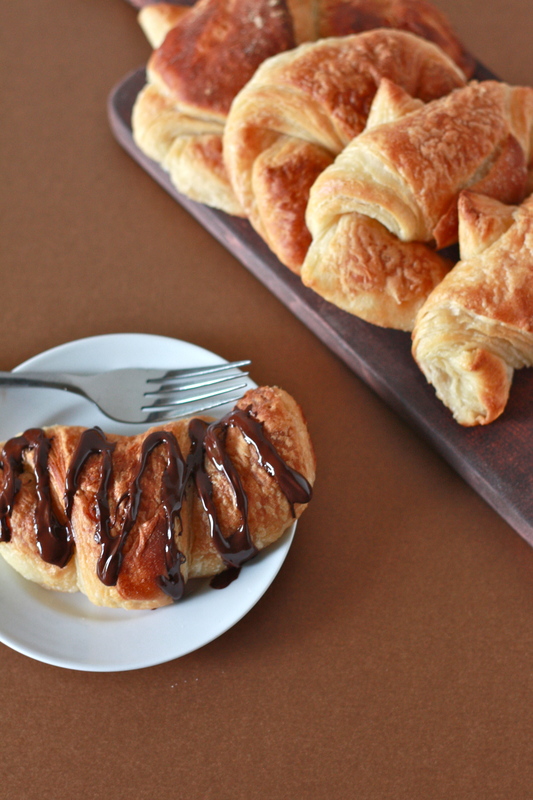 I used three pieces of Dove Dark Chocolate inside two of the croissants as an experiment and also melted a few pieces to drizzle on top. I was afraid it would leak out, but it didn’t at all! Cream cheese is going to be the next experiment. For dough, combine 2¾ c. flour, yeast, sugar and salt in food processor. Add milk and pulse until blended. Add butter to the food processor and pulse. The dough should form a ball and begin to clear sides of bowl. The dough will be sticky but if dough sticks to bowl too much, add remaining ¼ c. of flour and pulse until blended. Remove dough and wrap in plastic wrap and refrigerate for 1 hr. To make butter square, place butter pieces and flour in food processor. Pulse until blended. Remove and wrap in plastic wrap and form it into a square. Refrigerate at least 30 min. Roll dough into an 11 in. square on lightly floured surface. Place chilled butter square diagonally onto dough. Cover butter square with dough, like wrapping a present, and pinch seams together. Using rolling pin, gently roll dough into 14 in. square. Fold dough into thirds to form a long rectangle. Starting from narrow ends, fold rectangle into thirds again to form square. Wrap in plastic wrap and refrigerate for 2 hrs. Repeat process, tapping dough from center and working outward, then rolling out to 14 in. square. 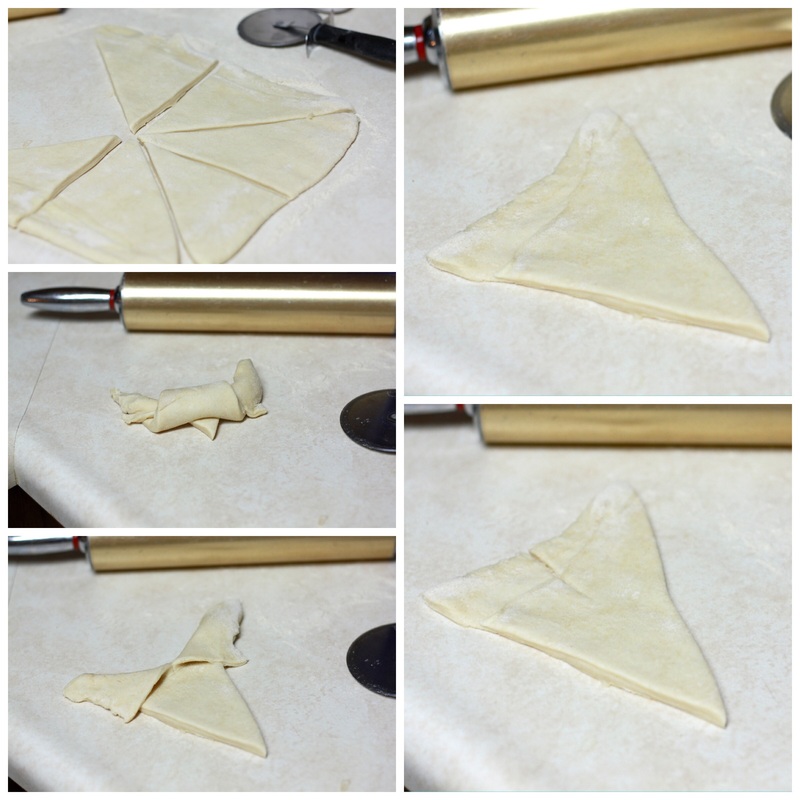 Fold dough into thirds to form a rectangle and into thirds again to form a square, completing two more turns. Wrap tightly and refrigerate for 2 more hrs. Line two baking sheets with silpats or parchment paper. Place dough onto floured surface and gently roll into a 20 in. square. Cut in half , then cut each half into three rectangles (I made a half batch in these photos) and then slice each rectangle diagonally to yield 12 triangles. Working with one triangle at a time, gently stretch the dough so that the two long sides are equal in length. Cut a 1 in. slit in base of the triangle. Fold the two corners of the slit outward and begin rolling the triangle up, gently stretching dough as you roll. Leave the last ¼-inch of the tip unrolled. See pictures above, clockwise from top left. I added chocolate to some of them, and it worked great! 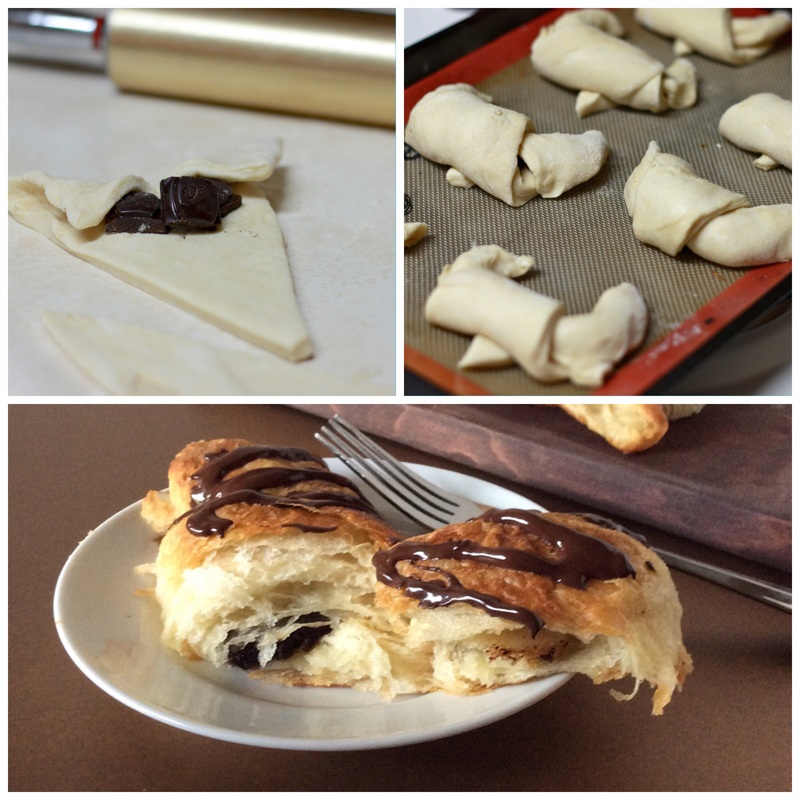 Transfer to prepared baking sheet and fold ends toward each other to make a crescent shape. Repeat with remaining portions of dough. Cover loosely with plastic wrap. Let rise at room temperature until puffy, about 45-60 minutes. 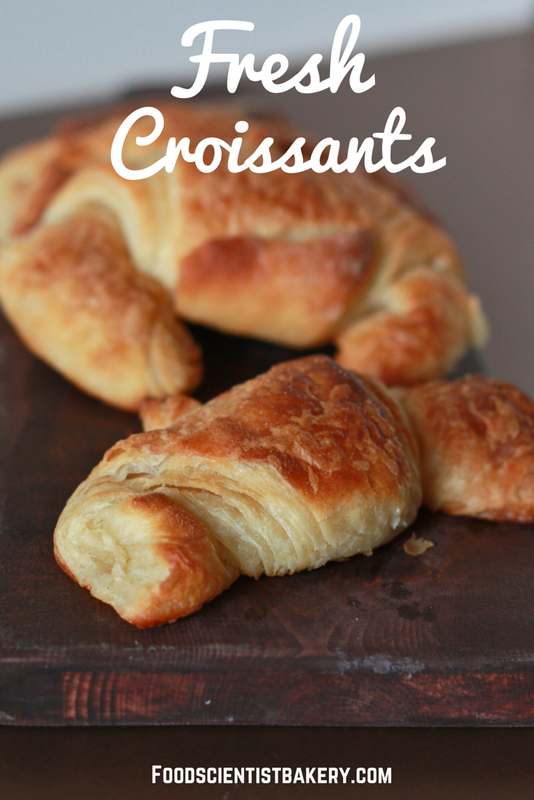 Preheat oven to 400 F. Bake until croissants are golden brown, 18-20 minutes, rotating halfway through baking. Cool on a wire rack at least 15 minutes. Store airtight at room temperature for up to 2 days or wrap well and freeze. Reheat in oven at 300 F for 5-10 minutes.